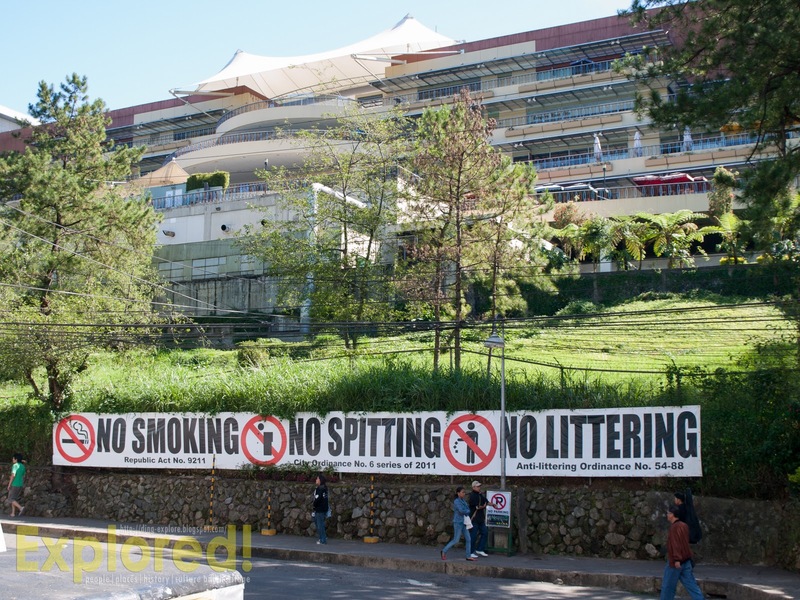 SNAPSHOT | Baguio City: Smokers beware! Something to be aware of when in Baguio. I was leisurely walking along Gov. Pack Road, on our way to an event at the back of SM City Baguio when I saw this sign, and the signs, I later realized, are posted all over the city! I learned, though, that one can smoke in designated smoking areas only. Hence you should ask your hotel, restaurants where you dine in, and other establishments regarding the designated smoking areas to avoid being apprehended and pay a fine. For the smokers out there, if you feel the urge while walking along the parks and Session Road, that stick of cigarette can wait. Munch a boiled corn sold in the parks have a candy or whatever that can satisfy your oral fixation. Better be forewarned and stay away from the hassle while on vacation or on official business. Now, there are three (3) major cities banning smoking--which starts with Davao City, the entire Metro Manila, and now, Baguio City. Nyah bawal na rin pala sa Baguio, yung sa Manila diba may restraining order? Yes, Christian. Mukhang bago lang inimplement. Ito yung nagustuhan ko talaga dati sa Davao, galing sana madagdagan pa mga lugar na magiimplement nito. @Lakwatsera and Mervin, indeed! Good move for Baguio City. This should be replicated to our place. Political will and people's cooperation is the key to implement this one.:-). i'm not a smoker, hindi ako affected nito. Awesome move! Baguio desperately needed/needs this. Especially malamig sa Baguio. Hindi basta umaakyat ang usok, it stays within the surroundings. I smoke occasionally, but I don't have any problems not lighting up if it ain't allowed. That's true Gay. Same here, and I think I am a responsible one...hehe. @Dee. Good for you! Thanks for the visit! kaya naman alang ka proble-problema yung non-smoker na tulad ko :)) alang iniiwasang lugar. Oo nga dennis! Hehe. thanks for dropping by. There are various websites in the market that offer cheap Tenerife holiday deals so even if you are going with family, you can still enjoy your stay in Lanzarote without spending any extra amount. Anyone knows where are these designated smoking areas?